On the Fifth Day of Christmas Apple gave to me…. 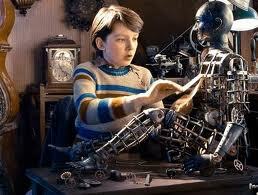 the movie Hugo. 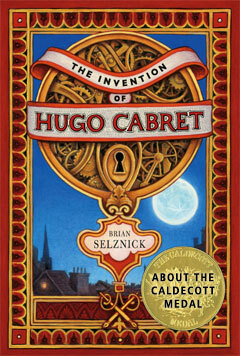 Hugo is an historical adventure drama film directed by Martin Scorcese based on Brian Selznick’s Calecott Award winning novel The Invention of Hugo Cabret which tells the story of a boy who lives alone in the Gare Montparnasse railway station in Paris with his Uncle. 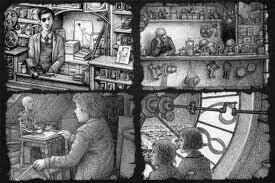 The story includes a mysterious cryptic drawing, his father’s treasured notebook, a stolen key, an automaton (mechanical man), and a hidden message from Hugo’s dead father. 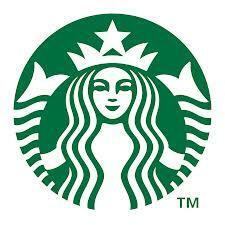 All of these join to make this a fantastical, spellbinding mystery. 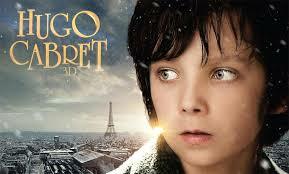 Hugo learns to maintain the clocks after his Uncle disappears while surviving by stealing food and supplies. He is also left with the task of continuing to build the automaton which his father began. Stealing parts from the toymaker in the station, Papa Georges, who ultimately catches him and steals Hugo’s fathers plans for the automaton. Papa Georges’ goddaughter, Isabella, joins with Hugo to retrieve the book. 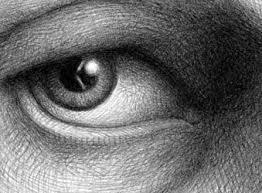 When the book was first released, I read it to my students in class… we were all mesmerized by the illustrations and astonished by the ending twist. 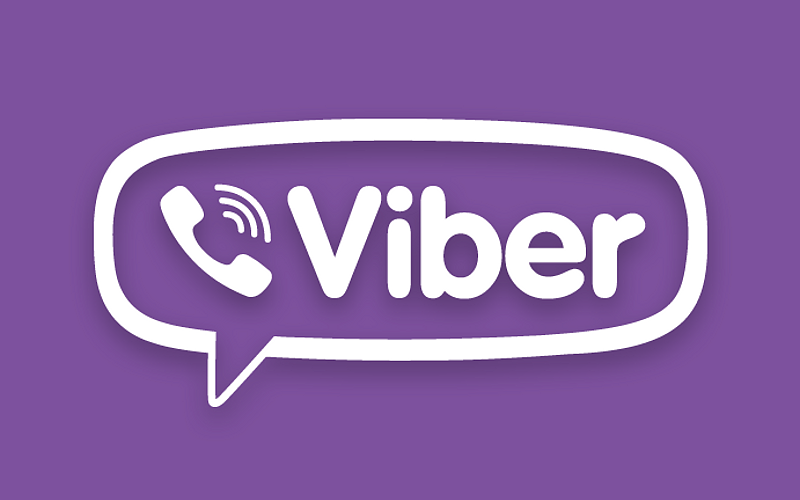 It is just an incredible story! I saw the movie, and while Scorcese did an excellent job, I believe the book was even more captivating. Good movie… great book! The movie is available in iTunes and the 12 Days App for 24 hours and can be downloaded on your PC and saved in iTunes. Have you discovered Hugo’s secret? Note: Home Alone was available for free for about an hour on iTunes (I checked) but then they took it down…it’s why I wrote about both initially, but have since removed the Home Alone post. 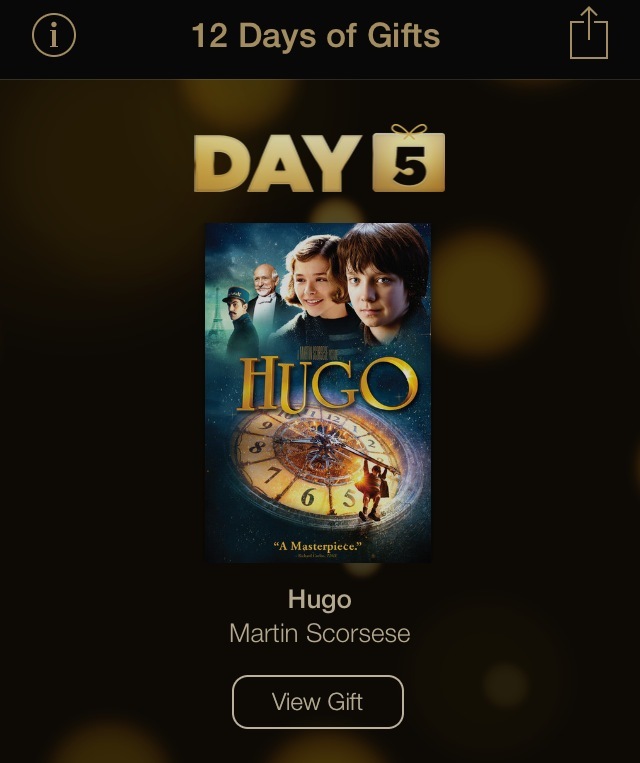 Be the first to comment on "Apple’s 12 Days of Gifts – Hugo -Day 5"